HomeNewsBUILDBASE SUZUKI’S COOPER ENDS SEASON WITH 6 WINS! 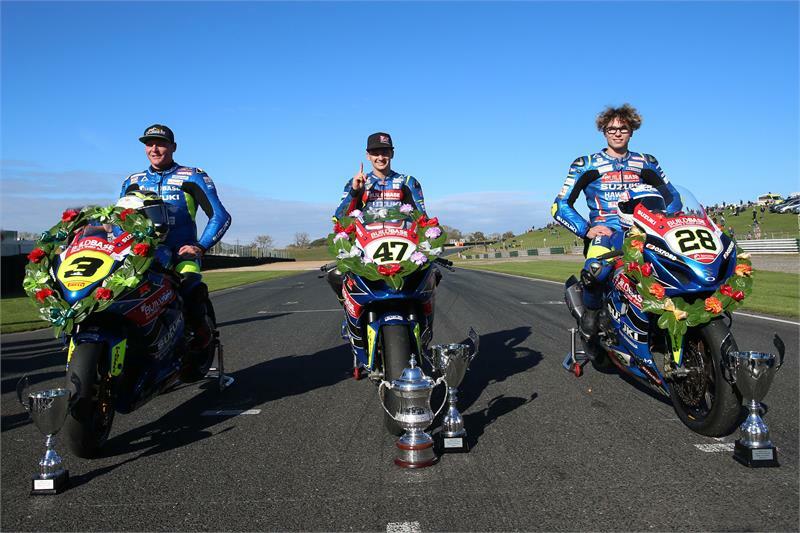 Richard Cooper made it six wins in a week aboard his GSX-R1000R over the weekend, as the Buildbase Suzuki rider added wins at the Sunflower Trophy races and the Mallory Park Race of the Year to his victory at the final round of the Bennetts British Superbike Championship. Cooper, won both Superbike races at the Bishopscourt circuit in Northern Ireland in his debut appearance at the end of season event, before recovering from an off-track excursion to win the Sunflower Trophy feature race. He was then in action at Mallory Park, where won the first Buildbase-sponsored ‘Open Race’ before winning the final Race of the Year, crossing the line ahead of his team-mates Bradley Ray and Billy McConnell, making it a Buildbase Suzuki 1-2-3. “It was the perfect ending to the season really after the BSB win last weekend. We flew out to Northern Ireland on the Thursday and qualified on pole, and to win the two Superbike races was good but the Sunflower is the main event and the gloves were off a little bit to be honest. It was a close race and bit of a battle. I got shoved off track early in the race, but knuckled down and got back up to the leaders and managed to ‘nick it’ on the last corner, and as a rider to win a race after a battle like that is great.